Eight members. A drum kit, timbales, congas, bass, guitars, trumpet, saxophone. Sparkles. Tutus. Cowboy hats. Tights. A stuffed zebra. Inflatable sharks being ridden across the stage, and subsequently playing the congas. Welcome to Vancouver's Five Alarm Funk, a multi-instrumental funk outfit that have been together for more than a decade. 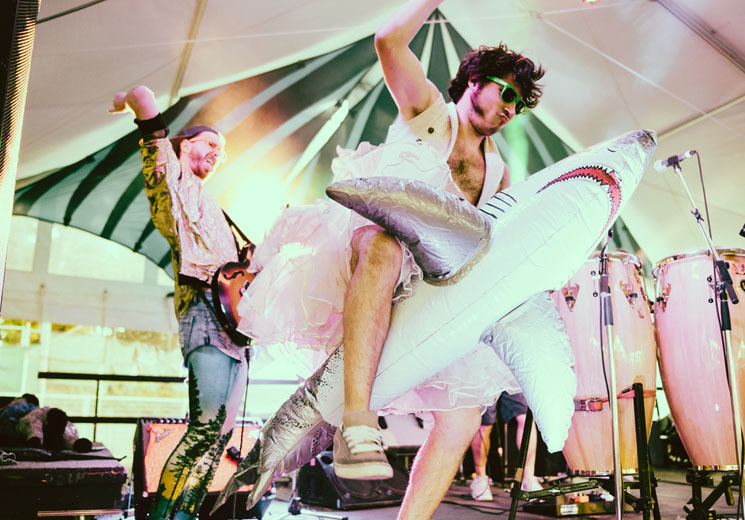 Gimmicky is their shtick, and it couldn't work better for them, as they offer costume changes, character cameos, inflatable shark hijinks, and enough energy to fuel the whole damn festival. In fact, it's what makes their live shows such an experience — their theatrics work perfectly with their loping ten-minute tracks, Ricki Valentine's cowbell and Tom Towers' train whistle and coordinated dance moves on everyone's part. Catching Towers mid-set behind the speakers changing into a sequined outfit simply confirms this band's greatness, and the crowd couldn't agree more — or so the Rifftop Tent shaking uncontrollably would confirm.